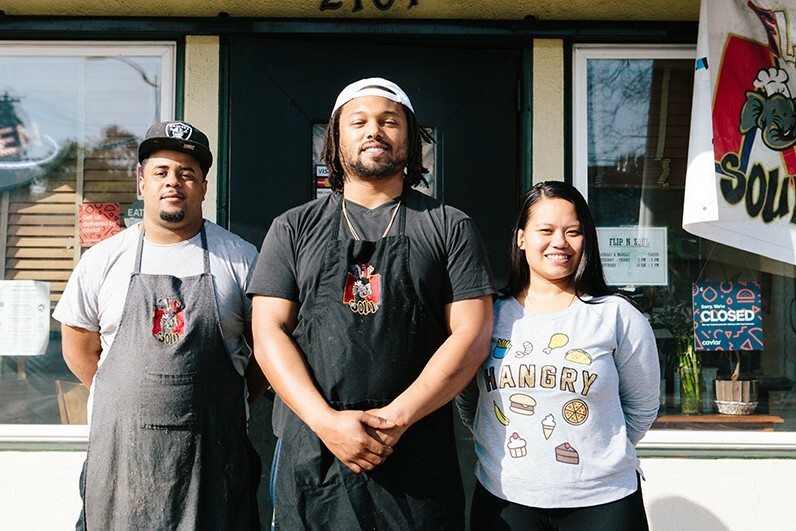 The takeout-only, East Oakland restaurant reflects the families behind its founders. A spread of fried shrimp, lumpia, and mac ’n’ cheese (left), plus gumbo, crab, and rice. After four years as a bored custodian, Brian Mouton called up his pregnant wife with some surprising news. "I just bought a whole bunch of food," he told Phoebe Mouton, who was then working as a receptionist. "We're just going to sell it and see what happens." On that fall day in 2014, Flip N Soul was born. With no food industry experience, the couple decided to chase their garlicky dreams, starting off with a pop-up, catering, and delivery business. A year later, they quit their jobs. And last year, they finally opened a brick-and-mortar restaurant in East Oakland, in the San Antonio district space formerly occupied by chef Charleen Caabay's popular Filipino restaurant Kainbigan. Originally, the Moutons intended for the restaurant to be a temporary, pop-up sort of thing, but now, there's no end in sight. Flip N Soul serves a mix of Filipino and soul food, reflecting the Moutons' backgrounds and decades of home cooking. They use recipes from both sets of moms and grandmas, in some cases passed down from their great, great grandparents. All around, it's a true family operation. Phoebe manages the restaurant and takes orders. Brian heads up the kitchen. Sometimes, they get help from Brian's dad, brother, sister, and mom. And their three kids occasionally make an appearance. In large part thanks to their social media savviness, Flip N Soul has built a massive and loyal base of customers. On Instagram, Flip N Soul has drawn some 26,000 followers. As soon as Flip N Soul opened on a recent Tuesday afternoon, a line formed out the door, with regulars ready to pounce on Flip's daily changing menu, a dry erase board propped up against a chair in the center of the room. "Pasta with Alfredo sauce? Oh, damn." "I'm about to go on that rib eye — with a lobster tail. Daaaaamn." It can feel a bit like a waiting room inside, partially because of the stale, fluorescent lighting, and partially due to the nature of Flip N Soul's takeout-only model. You queue up, order, and wait — sometimes as long as 30 minutes. Pick from a couple of scattered chairs and a couch covered in a graying sheet. Hip-hop is always on blast. The familiar smell of weed frequently rolls in. Once you get your food and leave, you'll probably notice most customers eat in their car. On weeknights, the neighborhood is full of solo folks behind foggy windows, huddled over plastic containers of steak, shrimp, and lumpia. Flip always serves lumpia, fried chicken, fried shrimp, chicken adobo, steak, and salmon, as well as some combo meals, plus sides. Usually, you can throw on a fried lobster tail for $12. But the eatery also offers a number of rotating entrées, such as that aforementioned pasta, gumbo, and garlic noodles. Some have designated days; others require sheer luck. On Tuesdays, it's catfish — and what catfish! Crispy, golden-brown, and flaky, it's as good of a version as you'll find anywhere. But my favorite fried item is the shrimp — so delicious, I had to order them twice just to be sure. Too often, fried shrimp feel like a rubbery waste of time. Here, the shrimp arrive just-cooked and juicy beneath an extra crunchy, panko-and-flour crust. On Wednesdays, Flip churns out wings with fun sauces. If you're craving fried chicken, Flip's version will certainly do the trick, but it's not as strong as other dishes — particularly given how many East Bay restaurants make excellent fried chicken these days. Thursdays are a big draw for Roni's Roasted Crab. Roni is the nickname for Troy Campbell, a cook at Flip and one of Brian's best friends from high school. (Another nickname: The Crab God.) On Thursdays, Campbell works his magic to produce meaty whole crabs loaded with black pepper and a secret blend of spices. It's wonderful, but I was even more impressed with the garlic rice beneath the crab — a buttery, Filipino version with just a kiss of soy sauce. The only downside is it's not terribly eat-in-your-car friendly. For that, order steak. Seriously. Brian thinly slices his rib eyes so they're easy to consume with one hand and a plastic fork. Thankfully, Brian also takes care to properly rest the meat so it remains tender and juicy. He even pulled off my medium-rare request despite the reasonably thin cut. On top, he poured Flip's house white sauce, a creamy and garlicky number whose ingredients are top secret. It also comes atop the blackened salmon, which was nicely cooked and generously portioned. On the side, I enjoyed solid mac 'n' cheese, green beans strewn with garlic, and candied sweet potatoes, although the most joy came from the lumpia, easily Flip N Soul's most popular menu item. The fillings change: One time, I ordered a special version filled with cheese and ground beef — definitely a novelty, and on my visit, a bit under-fried and anemic. The traditional pork was much better. Apart from lumpia, the only straight-up Filipino dish regularly on offer is chicken adobo. I wanted to love it, and while I enjoyed the flavor, the chicken was hopelessly dry and overcooked. From left to right: Troy Campbell, Brian Mouton, and Phoebe Mouton outside Flip N Soul. Still, I admire the humble, community-loving spirit of Flip N Soul. Most of the food is full of simple, comforting pleasures and prepared far better than you might expect based on its bare-bones setup. Across the board, the portions are large, too. I always had leftovers. Phoebe said one of Flip's goals for this year is to get some tables, chairs, and plates, so if folks want to sit and eat, they can. Down the line, she dreams of opening a second, sit-down location, or maybe a food truck. While these all sound like exciting developments, part of me feels attached to the current experience, from the waiting room to the car.